When we talk about cloud services (cloud computing) we mean the current trend to base applications on externally hosted services on the internet. However, the concept is much larger since there are different types of services. 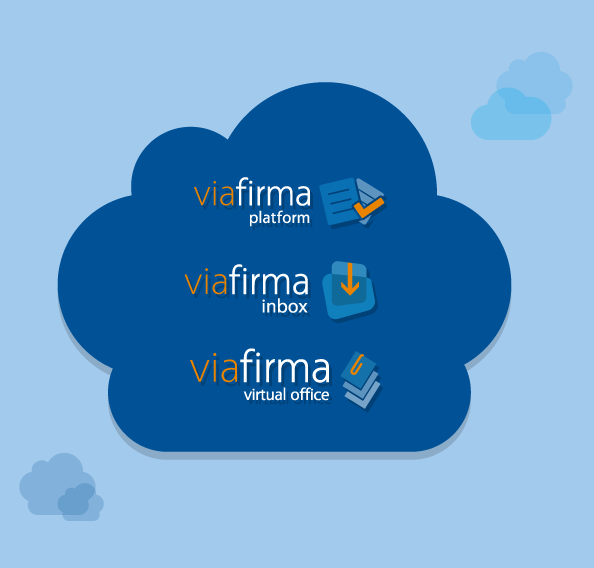 Here we focus on the mode in which Viafirma offers its services, SaaS. Its exact definition is SaaS (Software as a Service). This is a software distribution model where the company serves the maintenance, support and operation that clients will use during the time that has been contracted the service. The client will use the system hosted by the company, which will keep customer information in their systems and will provide the necessary resources to exploit that information. But, what kind of applications does Viafirma have in the cloud? Viafirma Platform: Authentication and electronic signature platform based on the use of electronic certificates with the highest level of security.Simplifies the development of applications requiring the usage of Digital Certificates, based on its inclusion as a service. Viafirma Inbox: Electronic signatures web agenda that facilitates the management of electronic signature and electronic document approval workflows, centralizing users signing operations in a single application. Viafirma Virtual Office: Complete platform for design, publish and manage any type of on-line procedure provided of a info layout with forms and documents. It allows to any public or private institution to create its Electronic Office, telematics services portal, intranet procedures, etc..
What can I do with the Viafirma’s applications intead of similar tools? Any Web application integrated with Viafirma is 100% usable from mobile devices, and can authenticate and electronically sign due to the mobile client Viafirma Mobile available in major applications markets. Besides this, with Viafirma Mobile SDK, native mobile applications can be integrated with the mobile electronic signature client and therefore with Viafirma Platform, allowing users to provide authentication and advanced and recognized electronic signing, thanks to our Viafirma SmartCard Reader which offers fully support for the Spanish electronic ID for iPhone and iPad. You can check statistics on the platform usage like what kind of operating system users are using, kind of browser or device thanks to Viafirma Manager. You can also manage, configure and customize the platform visually. What kind of advantages do I get respect to the acquisition of a license? No installation required, so the time of implementation is minimal. No need to worry about the maintenance of the application. Cost reduction. Payments are made monthly and they are a very economical amounts, matched to the business model. These prices allow the usage of Viafirma Manager and Viafirma Mobile. Viafirma is completly configurable, ie, I can set where I keep all my documents, from a physical path on my computer (although not the most recommended), use my DropBox account or use a ECM such as Alfresco, Microsoft SharePoint, IBM FileNet, EMC Documentum, or anyone who uses the CMIS standard. Mercofact – Implementation of a on-demand version for a digital signature platform, for integration with the buying and selling system in the invoices market. Izenpe – Electronic signatures agenda that Izenpe offers to public and private institutions of Euskadi, cloud computing format, completely customized for each corporation. Cevaldom- Viafirma Virtual Office on cloud computing format for telematization their processes.